Every time we get on the road, we are in awe of ALL the Lord does. Last week in Georgia was no exception. Every day was packed with divine appointments, miracles, and God's grace. But before we walk you through the regal week, we are excited to introduce our hostesses Susan Brown and Jaimie Brown. Susan and Jaimie are a mother-daughter team who started Grace 251, the most beautiful Christian gift stores we've ever seen! We met Susan and Jaimie this summer in Atlanta by divine appointment and started a dear friendship. They are women on FIRE for Christ and use their Christian retail stores as a platform for powerful ministry. 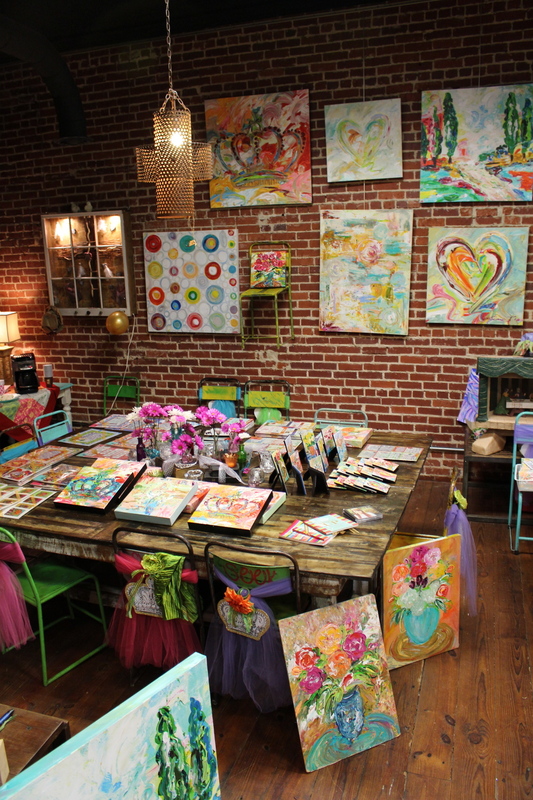 Last week, they welcomed us to Athens and their two retail locations in Dalton, Georgia and Cleveland, Tennessee. They also opened doors for us to speak to groups and ministries in the area from our book, Trading Up for a King's Daughter. 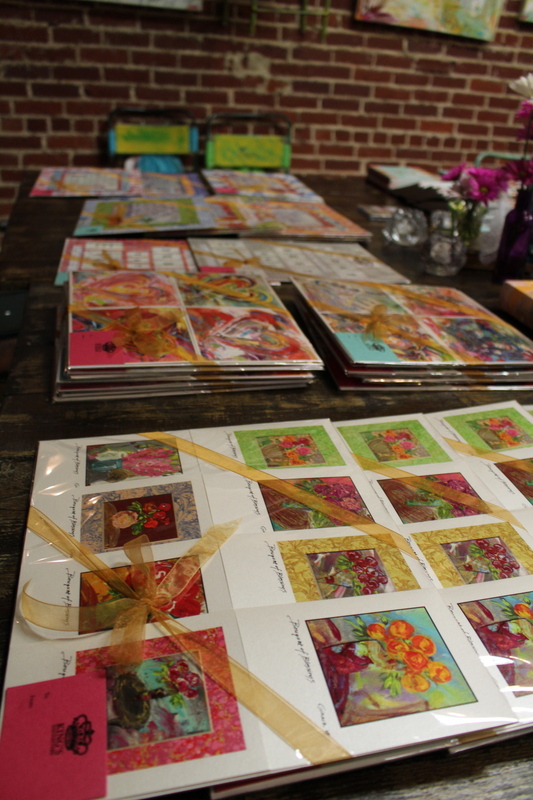 We started off the week with partnering with Grace 251 for a Trunk Show in Athens, Georgia. We also shared a message and music from Trading Up for a King's Daughter with the group of women and girls. Our amazing Athens hostesses, Katharyn, Julie, and Vanessa, made the day so much fun. We also LOVED meeting new Athens friends and encouraging them as regal King's daughters in Christ. Later that night, we were blessed to share Trading Up for a King's Daughter with the college girls bible study from Classic City Community Church. 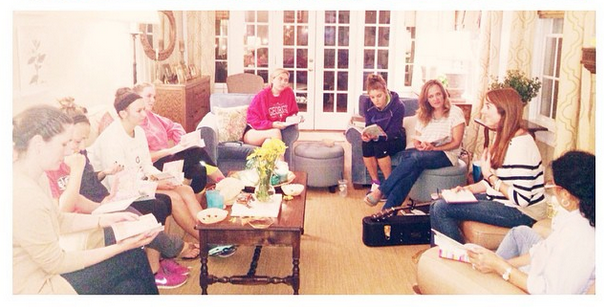 Monday night was a sweet time of sharing God's heart for an intimate relationship with His daughters. It was a privilege to come alongside the founding pastors of the church, Lee and Lisa Mason, as they pour out their wisdom and passion for discipleship in Athens. We had a day of divine appointments at Grace 251 in Cleveland, Tennessee! We met so many wonderful women and enjoyed sharing Trading Up for a King's Daughter with them. We pray that every woman and girl that walked in the door felt God's love. 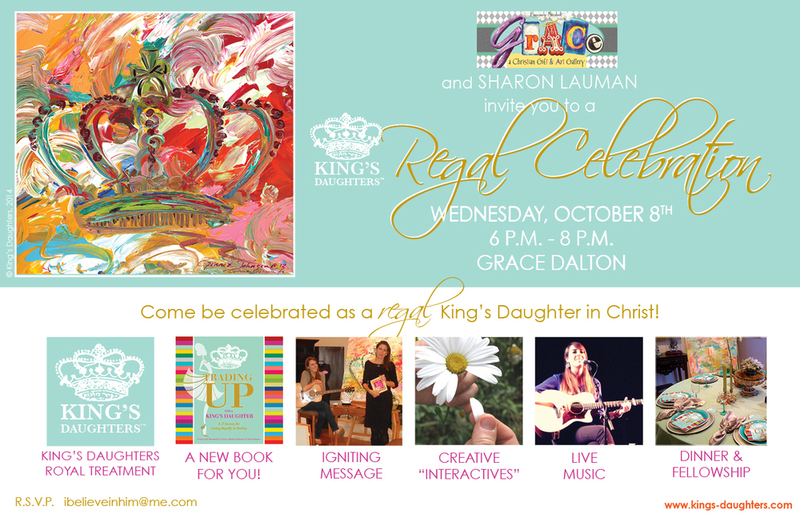 We pray she received a renewed JOY about her identity King's daughter and regal living in Christ. This day blew us away. God showed up and showed off when we spoke to the women serving time in Silverdale Jail. We partnered Sharon Lauman and her fellow Bible study leaders from Crosspointe Church, who have been discipling and loving these women for years. TRADE UP: Identity as an IN-TI-MATE daughter of the King! We all felt God's powerful presence break strongholds and heal hearts. God is so good. Praise Him for His mighty work at Silverdale Jail. He opened the floodgates of heaven and lavished each woman with love, identity, and joy. 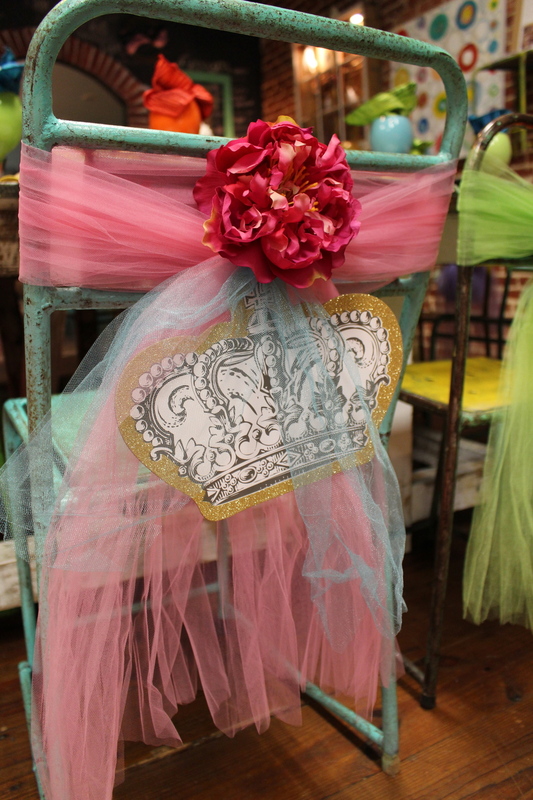 We placed a BK crown on every woman as she walked in the door. Each woman also received her own copy of Trading Up for a King's Daughter. Sharon, Connie, and Shannon will lead the women through all 26 A-Z Regal Living Secrets in an ongoing Bible study. What an honor to treat former inmates from Silverdale Jail and their daughters like the regal King's daughters they are!! 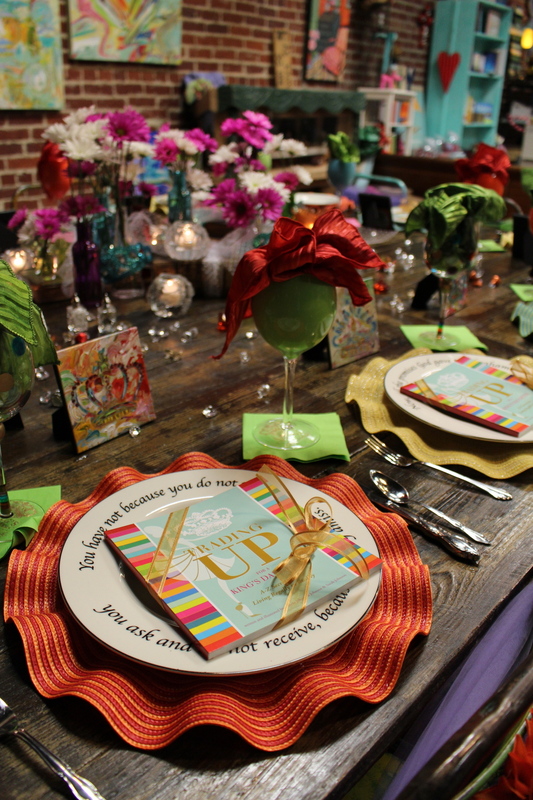 Susan, Jaimie, and Karen (their right hand woman) opened up Grace 251 and set a gorgeous table for our dinner party. We enjoyed a wonderful steak dinner and a time of ministry speaking from Trading Up for a King's Daughter The women left with a smile on their face and a heart full of the love God poured out throughout the night. Sarah: What an awesome opportunity to speak to the 7th-12th graders at Christian Heritage! The Lord gave me a word for these precious girls: "I don't want you to feel pressure to do for Me. I just want to be with you!" Having grown up attending a Christian private school, I know these words from the Lord were especially meaningful. 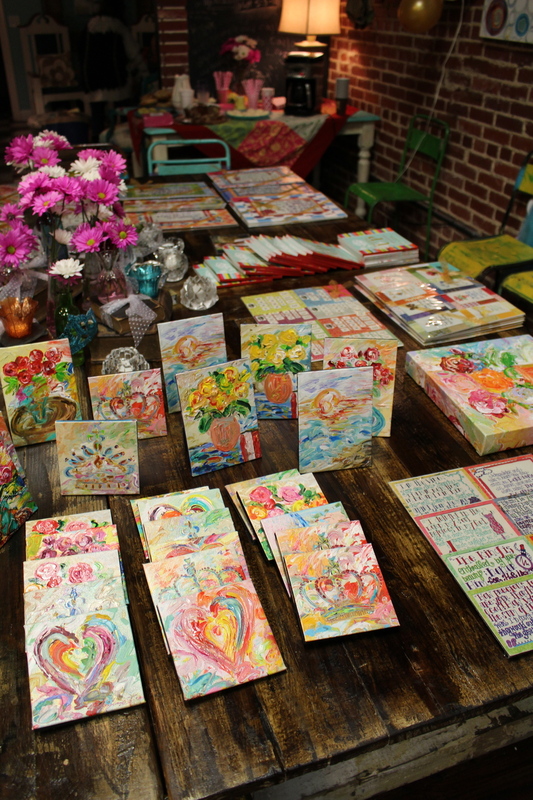 We had a lovely morning to share King's Daughters book, art, and gifts with Grace 251 Dalton. We absolutely loved our time with Susan, Jaime, and ladies of Dalton, Georgia. The Lord gave us the opportunity to encourage every woman that walked in the door! We also had wonderful times of prayer with women in Grace's prayer room (pictured). We love how God fills our schedule. We had an open afternoon and the Lord sent Catherine our way. She spontaneously invited us speak to the beautiful women at Providence Ministries, a rehabilitation ministry for drug and alcohol addictions. It was so meaningful taking a Regal Celebration to Providence at a moment's notice complete with the red carpet, crowns, and books. The Lord gave us a prophetic word of knowledge to encourage each woman individually. Catherine, gave each woman a copy of Trading Up for a King's Daughter. What a powerful afternoon! It is amazing how Trading Up for a King's Daughter fits every age and stage! 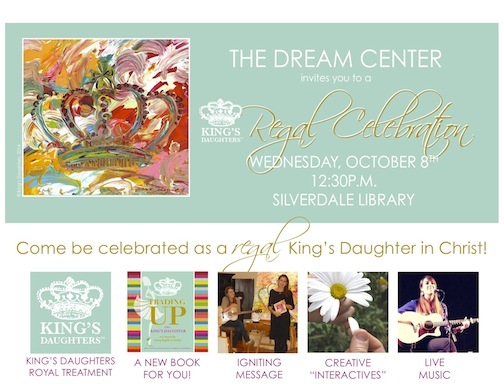 We were able to tell precious 6-8 year olds about who they are as regal King's daughters during this mother-daughter celebration! What fun to speak truth into their hearts at such an early age. All we can say is Thank YOU! Thank you to Susan and Jaimie for your friendship and allowing us to join you in encouraging and celebrating women and girls around the state. Thank you Katharyn, Julie, Vanessa, Lee, Lisa, Sharon, Shannon, Connie, Karen, and Catherine. But most of all, thank you God for opening doors and hearts. Thank you Jesus for making the way through your life, death, and resurrection for us to be King's daughters. Thank you, Holy Spirit, for empowering us to minister and teaching God's Word to each heart. 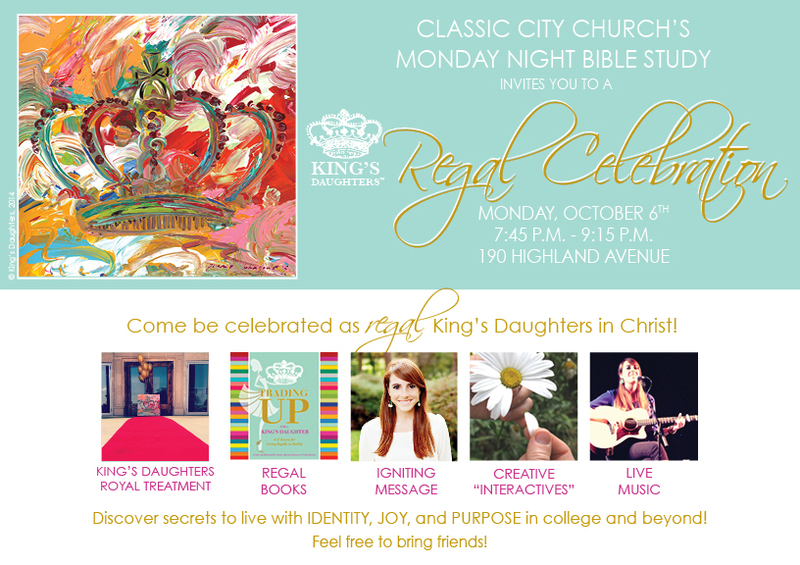 Thank YOU, reader, for taking the time to see the goodness of God in our week's recap of celebrating regal living as King's daughters in Christ.